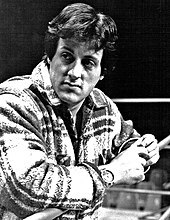 Following the success of Rocky, Stallone made his directorial debut and starred in the 1978 film Paradise Alley, a family drama in which he played one of three brothers who enter the world of wrestling. That same year, he starred in Norman Jewison's F.I.S.T., a social drama in which he plays a warehouse worker, very loosely modelled on James Hoffa, who becomes involved in the labor union leadership. In 1979 he wrote, directed and starred in the sequel to his 1976 hit, Rocky II (replacing John G. Avildsen, who won an Academy Award for directing the first film), which also became a major success, grossing US$200 million. In 1981, he starred alongside Michael Caine and soccer star Pelé in Escape to Victory, a sports drama in which he plays a prisoner of war involved in a Nazi propaganda soccer game. That same year, he starred in the thriller Nighthawks, in which he plays a New York city cop who plays a cat-and-mouse game with a foreign terrorist, played by Rutger Hauer. In 2000, Stallone starred in the thriller Get Carter, a remake of the 1971 British Michael Caine film of the same name, but the film was poorly received by both critics and audiences. 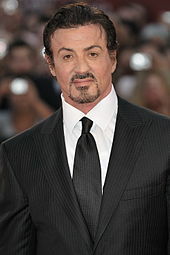 Stallone's career declined considerably after his subsequent films Driven (2001), Avenging Angelo (2002) and D-Tox (2002) were also critical and commercial failures. In 2003, he played a villainous role in the third installment of the Spy Kids series: Spy Kids 3-D: Game Over, which was a huge box office success (almost US$200 million worldwide). Stallone also had a cameo appearance in the 2003 French film Taxi 3 as a passenger. ^ "Sage Stallone, Son of Sylvester, Found Dead - Cause of Death Still Unknown". WhatCulture.com. July 15, 2012. Retrieved September 23, 2018. ^ headgeek. 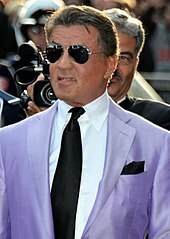 "Stallone answers December 9th & 10th Questions in a double round - plus Harry's Seen ROCKY BALBOA..." Aint It Cool News. Retrieved September 30, 2018.